We're closing out our stock! Joe's retiring from the compost toilet sales business. The Loveable Loo is a compost toilet for permanent indoor household use, office, bedroom, camping, shop, garage, barn, hunting camp, or emergency toilet use. No water, electricity, plumbing, venting or chemicals required. Odor-free when properly managed. No urine separation required. Ships by UPS. Easy to assemble. Available online since 2007! Assembly required (see video below). 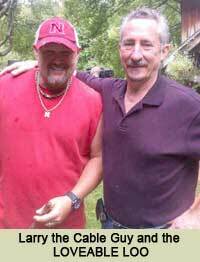 As seen on the History Channel: Larry the Cable Guy's Only in America, and on Treehouse Masters (Animal Planet). This is an eco-potty for permanent indoor (or outdoor) household use, office, bedroom, camping, shop, garage, barn, or emergency toilet use. No water, electricity, venting, plumbing or chemicals required. Odor-free when properly managed. No urine separation required. NOTE: You must have carbon-based cover material (not included) and you must have a compost bin (also not included), otherwise this toilet system will not work. Watch our videos about this sanitation system. Need compostable plastic bag toilet liners? Who would'a thunk it? A toilet that people love? When Jenkins wrote the Humanure Handbook and thereby introduced the world to the "humanure toilet," he didn't expect people to write to him saying they love their little compost toilets, but many did. Lots of proud humanure composters sent photos of their lovable toilets, some of which are posted on our website. They built their own toilets from instructions also posted on our website. In time, people started asking Jenkins to provide them with these little toilets, already constructed. They wanted them for their homes, camps, cabins, cottages, and to keep in a basement corner for emergency use should the power go out. The Loveable Loo has gone through 5 incarnations and was originally made of local hemlock lumber sawn by the Amish. We could not keep up with the demand and switched to 3/4 inch plywood. UPS kept destroying our loos in transit, so we changed the design a couple of times to prevent their destruction. Our last incarnation included Kreg screw joints and hardwood veneer plywood. The 2015 model is now shipped flat packed IKEA style and requires assembly. The material is furniture grade hardwood plywood completely finished inside and out. The fastening system is a combination of dowels and bolts, which is extremely durable. The parts are now cut on a computer controlled CNC machine and are perfectly accurate and uniform. These improvements have caused the price for the loo to go up, but we can now keep up with demand and even offer wholesale prices for resellers (call us at 814-786-9085 if you're a reseller). The finished loo is approximately 18 1/8 inches wide, 21 1/2 inches long and approximately 16 1/2 inches high with the toilet seat installed. Larry the Cable Guy watches Loveable Loos being made on the History Channel's Only In America (above). The Loveable Loo proves to be an effective toilet system in a tree house, as seen on Treehouse Masters (above). 1. The toilet itself: 3/4 inch hardwood-veneer furniture-grade plywood cut on a CNC machine, and oak style wood core toilet seat ($17.98 value). 2. Four green 5-gallon receptacles ($8.00 value per piece) with lids (the receptacles are shipped in a separate box). The toilet receptacle is not UV rated. It is a high-density 90 mil polyethylene that withstands temperatures up to 180 degrees Fahrenheit. The receptacles are labeled "Loveable Loo Toilet Receptacle - Use For No Other Purpose." 3. A "Read This First" instruction manual (can be read online). 4. A laminated "This is a Humanure Toilet" sign for posting by your toilet can be viewed online. 5. A Reotemp 20 inch backyard compost thermometer, all welded stainless steel. Every serious composter should have one of these. This tool will allow you to monitor the temperature of your compost piles. 7. One Humanure Handbook 3rd or 4th edition. Note: THIS PRODUCT WILL SHIP IN TWO BOXES. WE DO NOT SHIP LOOS OVERSEAS. IF YOU WANT TO MAKE YOUR OWN LOO, THE DIRECTIONS CAN BE FOUND ONLINE HERE. "We purchased our Lovable Loo one year ago. We live off-grid on the East side of Big Island of Hawaii, which is subtropical, extremely wet, and just altogether jungly and wild. We installed the Loo in our outhouse, which is half open-air, and half enclosed space. The Loo has stayed in amazing condition in spite of getting rained on and being exposed to hot hot humid sunny conditions and cold, damp extremes. It's well engineered and the materials are sturdy enough to withstand this crazy climates punishing forces. Most things that get exposed the way our outhouse does become moldy, rusty (any metal parts), and break down pretty quickly--even within a few months. Not the Loveable Loo. Also, the buckets that come with the kit have held up beautifully. Our Loo is the only toilet system we have, so the buckets are always in use. Finally, the instructions regarding the Humanure system are accurate and helpful. We built our Humanure piles with pallets, created the "bio mat" with heavy reeds and woody ferns, used sawdust as our carbon medium inside the Loo, and did exactly what the video and book instructs as we build the pile. We never have foul odor. We never have flies (and this is the tropics!) The piles (3 rotating--we fill one then move to the next) get hot (bio activity! ), shrink down quickly, and then become this dark, dank, earthy substance. Just beautiful. So full of fat earth worms, it's amazing. We just dug into the first pile (one year old) and it's nothing but dark, rich soil full of worms. We're going to let it rest a bit longer and then feed our citrus trees with it. Thank you." "Just wanted to send a note and say how happy I am with the new loo. I put it in a temporary storage shed here in Vermont while I wait for my yurt to be installed. It works like a charm! Got some sawdust for free at a local timber framing business and it works great. The compost bin is done and ready. Thanks again. You guys rock!" "Just received our loveable loo, thrilled with it. Thank you for excellent service and product at incredibly fair price. Will be spreading the word." "Love this toilet buying another one. Going to use in our guest house in back of my property. Very easy to assemble and has no smell. I use one in our shop too!! Don't need water or electricity. Does not smell, very compact, and can be used anywhere." "I have been looking at composting toilets for awhile and was getting close to making a purchase. I had not checked out your products yet and a friend suggested that I did because he had used one for a year. After just watching a few videos I was convinced this was absolutely the best system, for every reason. I commend you and everyone associated with the Loveable Loo. I love your product and mission and I will be spreading the word - trying to make more converts." "I bought your [Humanure Handbook] few years back and finally made a sawdust toilet last summer from your design plans for my yurt in VT. Just want you to know I am EXTREMELY happy with it. I had tried a number of other methods to deal with my humanure with unsatisfactory results. I really like using the toilet because it is quiet, no sound. Kind of a zen experience...no need to meditate just poop and pee-:). Anyway I just wanted to thank you." "I was fortunate enough to be loaned a copy of the Humanure Handbook and to be honest, I can't say I was too enthused about reading about poo. However, of all the books I have read, I can honestly say I got through this one very quickly. The book is so well written both from a knowledge point of view and from a humorous point of view too. Some information was completely shocking and has certainly changed the way I view things." "We had not planned to convert to a compost toilet but we do not have a mains water supply and last summer was particularly dry for us in central Portugal with no rain for 10 months. This meant flushing the toilet was a complete waste of water. I reluctantly agreed to my wife's suggestion to convert to a compost toilet system and after reading the handbook and actually using the system, I can say I have been converted." "I built one based on your design and have since built a new one that incorporates a separate container for the cover material. The original one was transferred to a bedroom when my mother-in-law who is 82 came to visit. She needs the loo at night, but getting to the bathroom can be difficult at night time. But with the loveable loo in her bedroom, she said it was like having an en-suite. So thanks for the information and thanks for a great loo." "I love my Loveable Loo® and have had absolutely no problems with the system. I have no odors at the toilet or anywhere in my house which is a fairly open floor plan. In fact, because I did have to take out walls in the bathroom, the loo lived temporarily in the living room under a blanket so I'm VERY sure there is no odor with these toilets if the directions for using one are followed...So two months and going for forever! I love it. It works, it's clean, it's easy, it's inexpensive, takes very little time and it is exactly as you described it in the book. Again, I think people will have complete success with this, as I have had, if they just follow the directions in the Humanure Handbook. I am living in a strawbale home, I am off the grid with solar power and have been able to incorporate a lot of sustainable and green living practices. But I still had that flushing toilet and it really bugged me! Thank you so much for helping me get rid of it!" "I just wanted to say thank you for doing your work so well. I just unpacked the crate and box of receptacles. The contents and packaging have been planned and thought out so carefully, everything we need and more. I look forward to telling others about your product." "I just wanted to say that my wife and I are very happy with your product. We have been working to be off grid including off sewer. We started with a very expensive complicated and large composting toilet from (...being nice...). It had a solar panel and fan and we had problems with toilet flies, smell and getting the waste out to the outside composting area. It was a disaster of the worst sort. The simple small Lovable Loo® has make our lives sooo much better." "Bought two Loveable Loos® a few months ago and they are both in operation, one indoors one in an outhouse, and they both work great. Keep up the great work." "Using a Loveable Loo® was our first experience of using a toilet that didn't flush. Needless to say we were apprehensive at first, especially as we had chosen to make it the only kind of toilet in the barn that we were transforming into our home. Our fears were unfounded however and no one in our family has any complaints. Even guests are pleasantly surprised and our loo is now quite a conversation piece." "I have purchased several of your “humanure” toilet systems and used them for several years. After having purchased and tried virtually every other composting system on the market, I have found yours to be the simplest and most effective (read, odor-free )." "I live in Baja California, Mexico on a ranch. We have a pizzerìa here and have used your humanure composting system here and I'm proud to say they work perfectly. What I love most is to be able to expose ordinary people to this system so they can see how clean, odor-free, and water saving this is. I bought your e-book (best book I've ever read)..."
Absolutely beautiful wood work. The guys and gals at the Humanure Store really take care of their customers. The toilet box is perfectly made and we put it together within 10min. Love this toilet buying another one. Going to use in our guest house in back of my property. Very easy to assemble and has no smell. I use one in our shop too!! This is a great way not to use gallons of water and be kind to the environment. You need to get your preparation done before you set it up the system. You need to have a dry covered bin for the sawdust and your compost bin for the humanure ready. I've been using one of these since 1977.